The man is the searing sun in the metalverse. Though he will one day die, there seems no end in sight to the energy he pushes out, fueling us all by the thousands. His imitators are so numerous they will forever remain uncounted. Those of us who have raged in his burning light for the past decades will always retain a throne for him. The effect of his body of work is so ferocious and widespread that there cannot be one doubt about his status as the reigning vocalist in all of metal. As if his work in Iron Maiden was not pasted with enough laudatory superlatives, he began a solo career in 1990. Fifteen years and eight albums later, still seemingly incapable of making a bad record, Bruce releases Tyranny of Souls which many will hail as his finest moment… so far. Like most of his past albums, Tyranny’s music is not outshined by the reeling work of Bruce’s vocals. Guitar tracks laid by the up and coming virtuoso, Roy Z, nothing is predictable and the want for Adrian Smith is at least temporarily forgotten. Tyranny’s faults are few. The diversity of the album occasionally leaves the listener feeling pulled out of element, despite that each track individually is fine work. This would likely not be so much of a problem if not for the sensation that the album is over too quickly. Forty-three minutes and change is hardly unreasonable, but the album feels like it’s lacking a track or three to bring in a little more cohesion to its variety. Nonetheless, Bruce continues to make it more and more difficult for fans produce best-of playlists of him, especially those that would fit on a single CD. 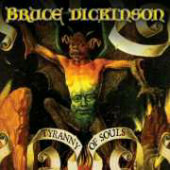 Bruce’s performance on Tyranny of Souls is not to be missed, and although openly sporting a hard-on while listening to this album might make people uneasy, no one will mind if you gush over it.